During mastering and creation of a CD-R master disk or DDPi (Disk Description Protocol image file set) a mastering engineer has been able to insert an ISRC code on a per track basis in the Red Book CD sub code data. An ISRC code is a 12 digit alpha-numeric code which uniquely identifies any given music track or version. This code is predominantly used in broadcasting facilitating correct royalty reporting and specific track identification purposes (instrumental, edit, radio version etc.) There is also a designated ISRC code “ID3 tag” for an MP3 file which can be edited in using an application post MP3 encoding. Until very recently (somewhat surprisingly) there has been no official provision made for embedding an ISRC code into a .wav file. The music industry is not known for it’s speed of change when it comes to official practice and the closest we have managed is inserting an ISRC code within the “description” meta data field within a broadcast wav. But rather than be recognized in any official capacity it has always been seen as a belt and braces “done thing” in the instance that some automated system or a human would be able to see the data. Additionally it did not travel well and was stripped out when any file format conversion was made, however it was better than no ISRC code data at all. It is very important and welcome news to know that the Music Producers Guild and the EBU (European Broadcasting Union) have come together after an industry push to formally allow an ISRC code to be embedded in a specific and recognizable designated field in a broadcast .wav file. XML data can now be added to the axml data chunk of a broadcast .wav file. So with this new development within the broadcast .wav formatting it will mean the file can be correctly identified in official capacity for royalty reporting, tracking and identification purposes. This is a very positive step forward for music identification and ensuring you get paid your hard earned dues. 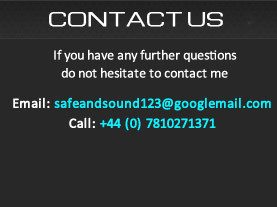 At SafeandSound Mastering we can ensure that your all important ISRC codes are correctly embedded within wav files. If you require an ISRC code/s very quickly (as you have not yet applied for them) please explain this at the time of mastering and I may well be able to advise on an alternative option.